Looking for a vegetable snack for your iftaar/Ramadan? Then try this vegetable cutlet recipe. 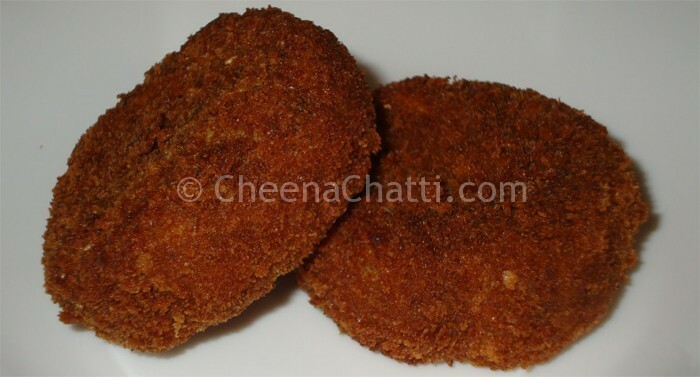 These vegetable cutlets are very popular snack items ideal for tea time or as an appetizers. Try this step by step veg cutlet recipe and let me know your comments or thoughts. Pressure cook the potatoes, carrot and beetroot. Peel the potatoes, beetroot and mash all of them together. Keep it aside. Mean while in a medium sized pan pour some oil and heat it. Add the chopped onions, ginger, green chillies and saute till it turns soft. Add pepper powder, garam masala and saute it for 2- 3 minutes. Turn off the flame and allow the mixture cool for 10 minutes. Once the mixture is cooled add the mashed vegetables and mix well using your hands. (The mixture should hold shape when rolled into balls). Now roll out small portions of the mixture into lime sized ball and flatten them between your palms to give it shape. Dip each of the cutlets in beaten egg and roll them in breadcrumbs, making sure that all sides are nicely and evenly coated. In another pan heat the oil and deep fry the cutlets in medium flame till they become golden brown. Serve these tasty veg cutlets hot with tomato Ketchup. Need more cutlet recipes? Dont worry, try these. This entry was added on July 31st, 2013 by Renoos in Bakery and tagged with kerala vegetable cutlet recipe, how to make veg cutlet, best cutlet recipes, spicy vegetable cutlet recipe, evening snack, tasty kerala cutlets, cutlet, vegetable cutlet, indian vegetable cutlet. Last revised on March 29th, 2018. Any chances of shallow-frying one??? @Palaharam : feel free to share the recipes..
@Nimmi: Sorry for the wrong info. Sauting for 2-3 minutes is enough. Thanks for pointing out it, I just updated the post. Dont forget to share the outcome with me. Hope you will prepare it great. hi, i like your page but if u put some pictures or step by step instructions it;ll b more useful.thnku. Thanks for the suggestion Seema. We will look into this..
seema i think still u r trying new items. We prepared it at home and the results were amazing. Came out Pretty Good. Really enjoyed it. Thanks for the recipe Renoos. Thank you Ankita. Good to know it came out well for you 🙂 Cheers..